A Lily a Day, Keeps the Doctor Away! Unknown to most, plants have an energy that transfers to people. I have seen it myself after a long hard day, a little flower and sunshine can go a long way and is a heck of a lot cheaper than therapy. When you have a plant or collection of plants that provide colors and aromas in your landscape that bring you happiness, you can change your whole perspective on things by just paying them a daily visit. Not to mention, you can tell them all of your secrets and woes, they will listen intently, then never tell a soul. 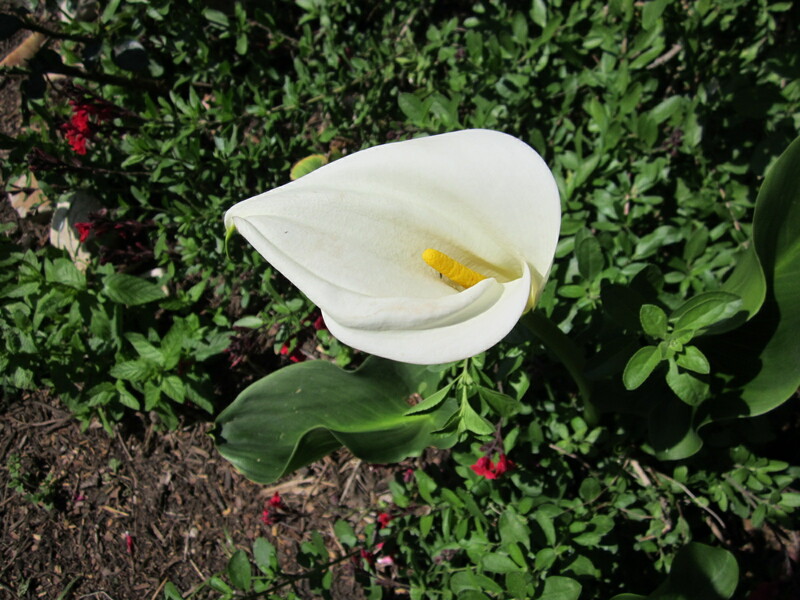 The Calla Lily is an excellent plant for the Austin Texas Xeriscape garden. It also happens to be one of my wedding flowers which brings back beautiful memories. Lilies are one of my favorite flowers and frankly, they happy me…I have special memories associated with these flowers and seeing them brings me back to those times. Memories of smell and sight are incredibly powerful and recreating those experiences by surrounding yourself with your favorite colors, smells and tastes can take you to a tranquil place that only your garden can provide. If lilies are a flower that take you to your happy place, you will be pleasantly surprised to know that they do really well in the Central Texas landscape. Calla Lilies were one of my wedding flowers (found out after I chose them that both of my grandmothers had used them as well) and they are a beautiful addition to the Texas landscape for zones 8-10. They are super low water, no maintenance, full to part sun plants and while they only bloom for a few weeks, the leaf structure it leaves (pun intended) behind is very cool in the landscape. ‘White’ does much better than other colors from my experience. As always, compost your soil each spring and fertilize bi-weekly with liquid seaweed or Molasses (alternating is best) and all your Xeriscape plants will benefit and thrive in our heat. Asiatic Lilies are another one that does incredibly well in the Austin, Xerophytic, full to part sun garden. Hardy for zones 4-9, they are an upright elegant addition to the late spring, early summer landscape. They bloom for a few weeks, then die back to the ground, but if you could find a few spots to sacrifice for the spectacular color these Lilies offer, you are well served to do so. 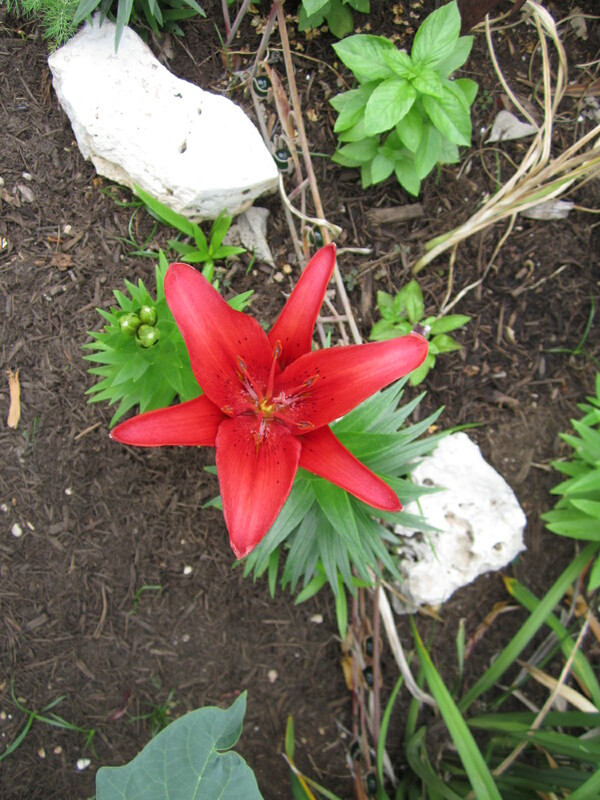 Asiatic Lily is a burst of color in the late spring, early summer landscape. They are fantastic at the front of your beds for interest and a pop of color. Red is one of those colors that grabs me! A very common “gift” Lily that most people don’t even realize is such a super plant in the Xeriscape garden for zones 4-9 is the Easter Lily! Who’d have thunk? Mine is not only a prolific late spring bloomer, but it also spreads and covers more territory with each passing year. Fragrant, fabulous and its huge bright white flowers make a statement in any morning (sunrise to 1-ish) sun garden. Aside from the religious symbolism, the tranquil color and fragrance of this Lily is a welcome element to any space. 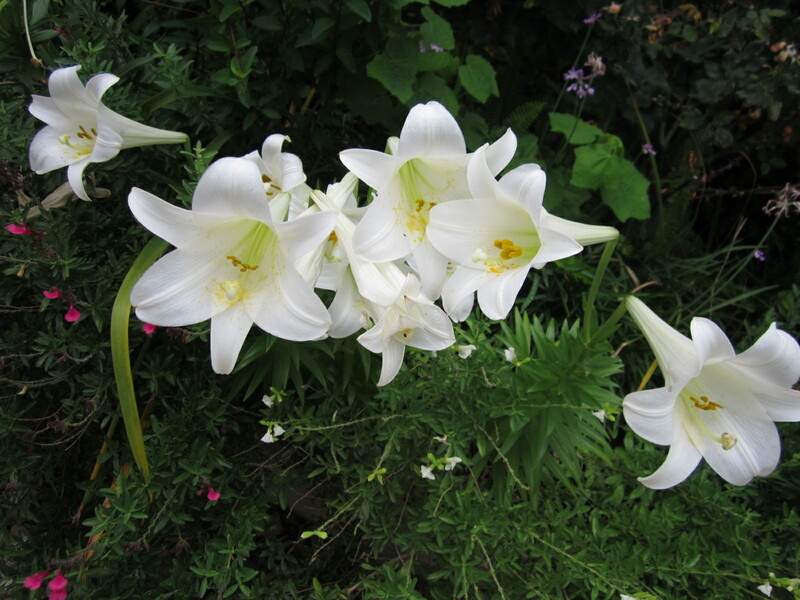 Easter Lily is a spectacular Lily in and landscape regardless of its religious connotation. Everyone needs a little “peace”. 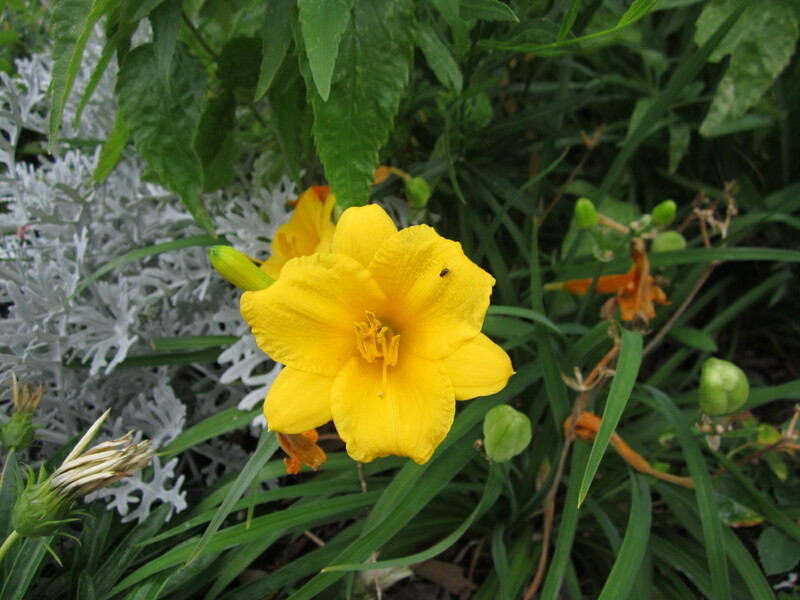 Probably the most common lily for zones 3-10 is the Daylily. 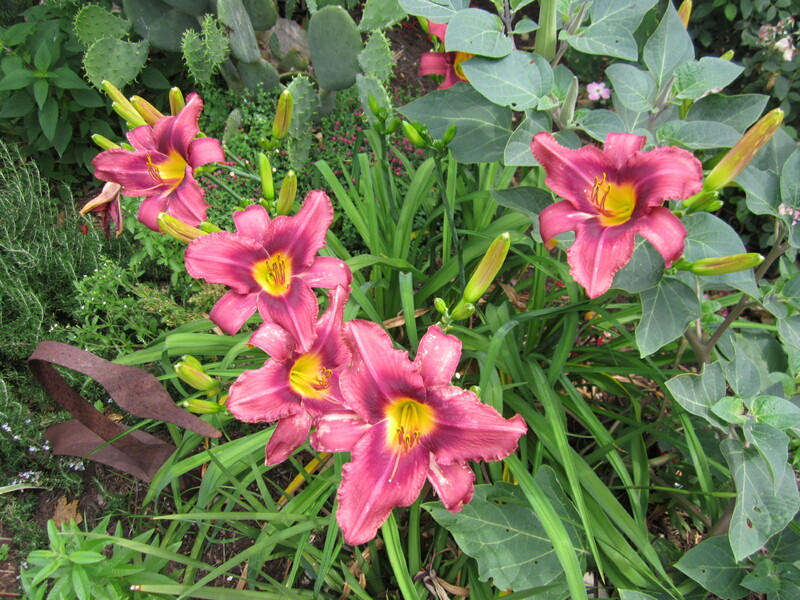 Daylilies are another Lily that does fabulously in a Xeriscape garden and comes in an array of colors from yellow, orange, red, purple, mauve and pink. It is a repeat bloomer and while it gets its start later than the above Lilies, it lasts a lot longer then makes a late summer come back if your lucky. Daylilies are semi evergreen in some areas, meaning they are coming back almost as soon as they leave. The long upright slender leaves are present all season long until the first freeze, but make a quick comeback as soon as the warm temperatures return. Super low water, full sun, and spectacular! …to palm sized and loaded with exquisite color. So I hope I have inspired you to try some Lilies in your low water, Xeriscape landscape, or maybe to buy a few discount ones after the season just to give them a try. Lilies spread so they make great gifts and are lots of fun to share and trade with fellow gardeners, making new special memories for them as well. 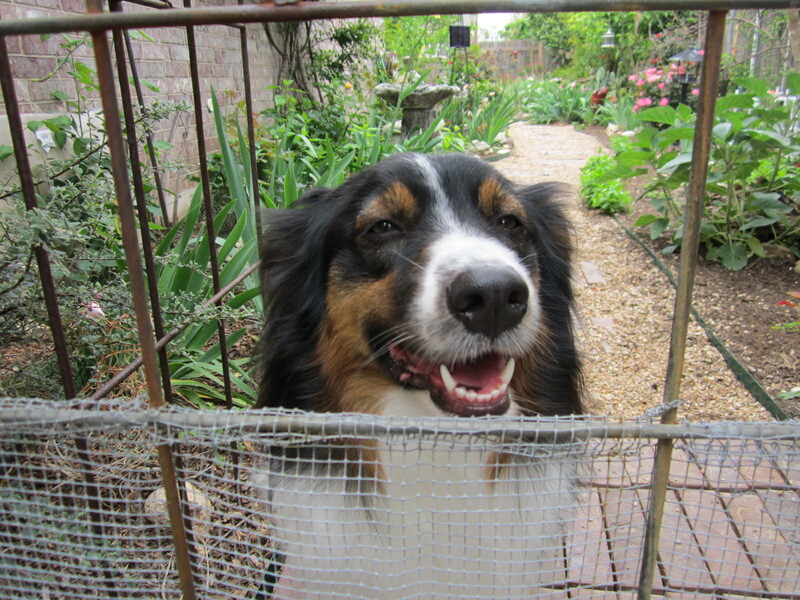 “Lily” of the garden. One of the best Lilies a gardener could ever ask for! No go get your Lily garden on!